Physics nerds and nonphysics nerds alike can enjoy Logic Consulting’s new app, Newton’s Balls. 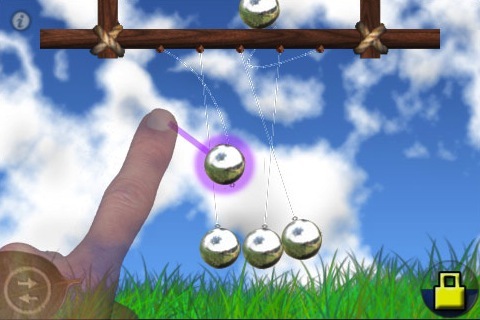 The app is a kinetic physics Newton cradle simulator. Try and say that ten times fast! Newton’s balls demonstrate kinetic energy and the conservation of momentum principle. For those don’t remember anything but E=mc2 from their physics days, kinetic energy is the energy that an object (in this case, balls) gains because of its motion (you moving it around). And the conservation of momentum principle states that measurable properties of any isolated physical system (again, balls) is not affected by anything occuring outside of that system. The game acts like the real, tangible version seen on business persons’ desks. Users play by touching the balls and positioning them to throw. This will create kinetic energy while the balls hit back and forth. Unlike other games, Newton’s balls doesn’t have a rigid stick and balls appearance and allows more freedom. To tilt control the gravity, touch the gravity lock located on the lower right-hand corner of the screen. To change the ball material from wood to steel or vise versa, select the icon on the lower left-hand corner. If you select the info screen at the upper right-hand corner, you can change the number of balls you want to play with (from 1 through 6). Newton’s balls is a basic app that shows realistic physics. The sound is precise with the balls hitting each other. Also, the multitouch control is a nice feature. The game also takes advantage of the iPhone’s accelerometer and responds well to tilting and shows the effects of gravity. The sounds of the different balls hitting each other produces a calming effect much like the real version. It may provide fun and enjoyment for some, and it can serve as a tool to teach children basic physics principles. Another nice touch is that the different balls have their own unique physical characteristics. The app probably draws a niche crowd since it doesn’t do too much. To attract and retain that crowd, Newton’s Balls developer could add additional backgrounds and ball options in future updates–the one background and two ball options get old fast. Overall, I would not recommend this app for most users because it serves a very limited purpose and fits the needs of a select audience. Most people would grow bored very easily. But if you’re interested in physics you might find this game worthwhile at the $0.99 pricetag. AppSafari review of Newton’s Balls was written by Linda Ta on March 15th, 2010 and categorized under App Store, Games, Physics Based, Utilities. Page viewed 3534 times, 4 so far today. Need help on using these apps? Please read the Help Page.